Well, well it has been quite the exciting time around here the past couple of weeks. Last weekend was a Saturday Hippotherapy clinic. Sunday was a Centered Riding Clinic. 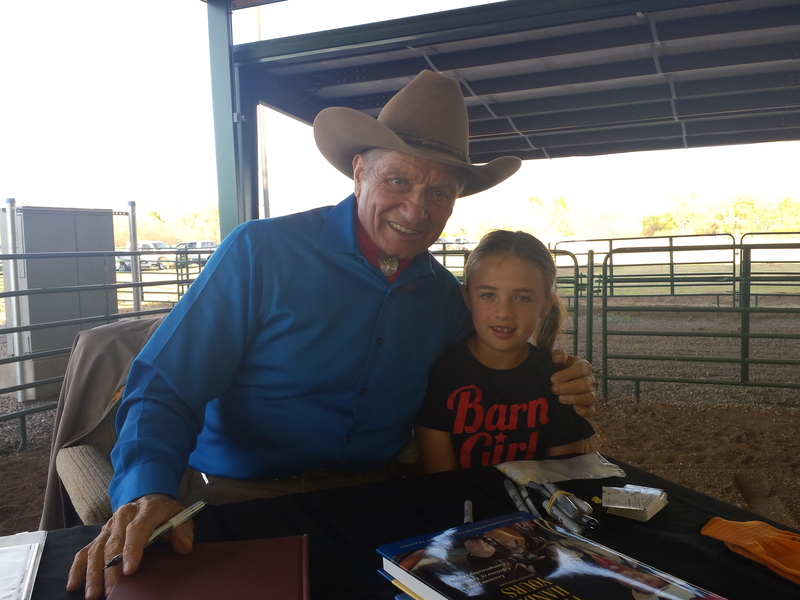 And then, this past weekend was a Monty Roberts demonstration which we attended with VIP tickets. Mind you, I have traveled to California “Flag is Up Farms” for clinics and expected to meet Mr. Roberts, but, alas-no he was out of the country. So to finally see him in person and talk with him (per the VIP splurge) was excellent to say the least. What I really like about him, specifically, is how he relates working with horses to life in general, to working with people. His book “Horse Sense for People” really is the greatest book I have ever read. He projects the skills used in horse communication to parenting, work relationships, career, life, everything. Trust, respect and communication being the basis for all things. He promotes non-violence in all ways (including our words). Also, he is 80 years old and still touring, teaching, training and riding. What an inspiration. The funny thing is that in all my horsey years I really didn’t know too much about Monty Roberts. Not long ago, an old college friend of mine who was visiting mentioned watching some Monty Roberts videos in his master’s program for teaching. He explained how it was used to open a discussion about how teachers teach and treat children. For some reason, that really fascinated me. And, from there, I started reading his books. Then, of course, my daughter fell in love with Shy Boy. We watched the documentary, read the children’s version of the book together and met Mr. Shy Boy when we visited the farm. I’m not one to be “star struck”, but I will say if I’m going to be–it’s gotta be Monty. Did I mention, that I (out of all the hundreds there this weekend) won the raffle for some free equipment AND got a hug from the Horse Whisperer. Ok, anyways. It’s been a good couple of weeks of learning and re-energizing. For all we know, we always continue to learn. Any (horse) person who treats others as if they know it all, is only kidding themselves and limiting their own possibilities. We are a community of people and we can learn from each other, we can respect each other, and we can always pick and choose what we want to use and/or believe. To accept from another and be open to new things is not to limit ourselves. Yes, I’ve watched one DVD like that called “In a Whisper”. I’m amazed too at the communication that can happen between humans and animals if we just figure out how they operate. We’re homeschooling on Jane Goodall right now which is very similar to what we’re talking about here. the way she learned to communicate with the chimpanzees is amazing. Sounds like a fun weekend and a great book! I had no idea Monty was 80!!! I bought his first book when I was on vacation in the UK years ago (late 90s). Then he came to the LA Equestrian Center to do a Join Up demonstration and book tour. I had my UK copy and stood in a LONG line to meet him. I did not have a camera, but I will still remember how he did a double take at my UK version of the book and I told him I hunted it down in a bookshop in London because my dad had seen a PBS program about his work with the Queen and so we knew the book was there. So I count myself among the first to know about the Man Who Listens to Horses. Not that it matters. But it’s a fun memory. 🙂 That is an amazing picture your family can cherish forever. That is a terrific memory! I’m so glad you shared it. You wouldn’t believe he’s 80 by the way he rode and presented. His entire show was 6 hours and we were there an hour early and saw him participating in all the set up. I’m sure he put in at least 8 straight hours in the show. He also did 80 pushups in honor of his 80th birthday! 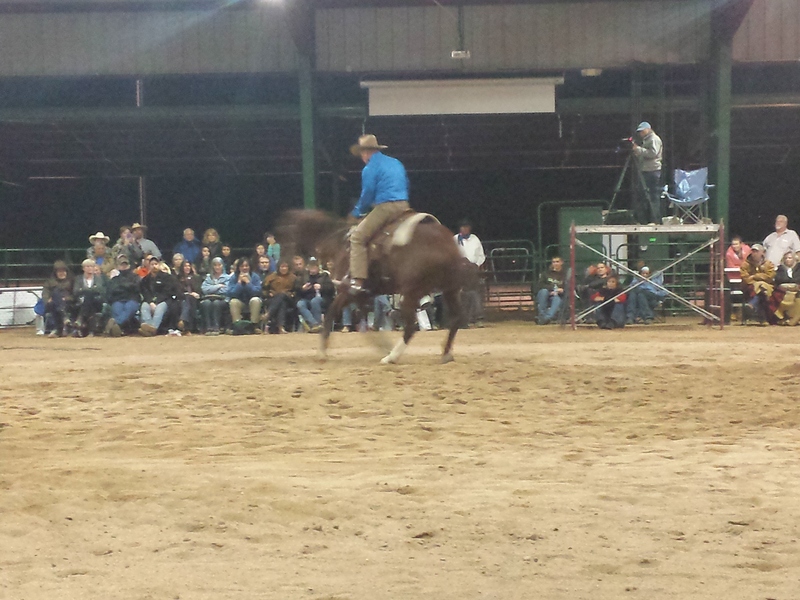 He, then, rode like a pro talking over the microphone the whole time and didn’t even seem out of breath. I am blown away…more than I could do that’s for sure! I am way out of my league here with the horse speak 😉 but it is so cool that you got to meet this person who is important to you. And his work sounds really interesting. I am certainly going to check it out! Wow, this is so wonderful. It’s great to meet you and know this about you. I’m heading to check out your other blog right now!